I. Lidski (pottery drawing) and L. Barda (GPS). The region (c. 150 dunams) comprises four hills, whose tops and the valleys between them revealed most of the ancient remains. The agricultural landscape, divided into six areas (A–E, G), was documented prior to its destruction. Area A, in the northeast of the documented area, was a strip in a valley, c. 500 m long; the other areas were on the hills and their immediate surroundings. The antiquities included watchman’s booths, limekilns, winepresses, hewn installations, burial caves and stone clearance heaps, as well as a built room (Fig. 1). 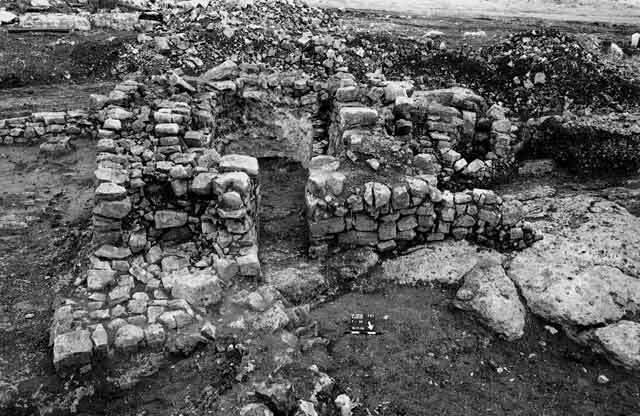 A preliminary excavation was conducted by E. Lass in Area B and a prehistoric excavation was carried out by V. Zbenovich in Area E.
Stone clearance heaps and agricultural terrace walls were discovered. Probe trenches excavated in four of the stone clearance heaps (Sites 500, 502E, 545D, 570) did not produce any datable finds. Three watchman’s booths (Sites 84A, 110A, 700) were recorded. Booths 110A and 700 were square and rectangular respectively (2.75 × 2.75 m, 2.5 × 4.5 m). Booth 700 was built of roughly hewn stones (Fig. 2) and contained several pottery fragments, dating from the Early Roman period until the end of the Byzantine period. Booth 84A was circular, built of large boulders and preserved two courses high. Toward the foot of the hill’s southern slope was a limekiln (Site 84; diam. 3 m, depth 2.8 m; Fig. 3). Its bottom part was hewn in the chalk bedrock and its upper part was built of roughly hewn stones. 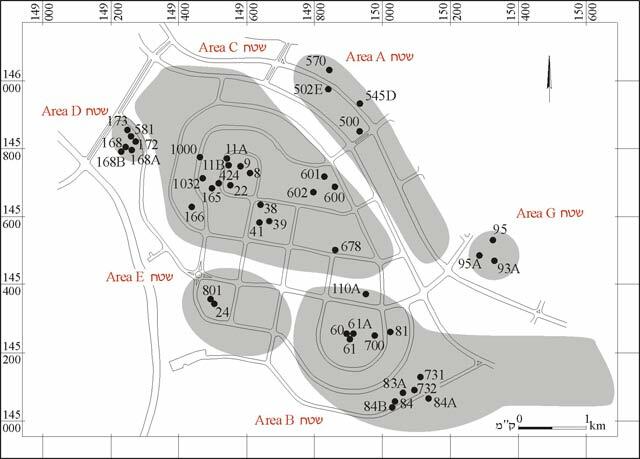 In addition, a water cistern (Site 81) was documented and five vats (Sites 60, 61, 83A, 731, 732) and two cupmarks (Sites 61A, 84B) were excavated. Numerous stone clearance heaps and agricultural terrace walls, located mainly on the slopes of the hills, featured in this area. Probe trenches excavated in nine stone clearance heaps (Sites 8, 9, 22, 38, 39, 166, 600–602) uncovered pottery fragments from the Byzantine period in Clearance Heap 38. 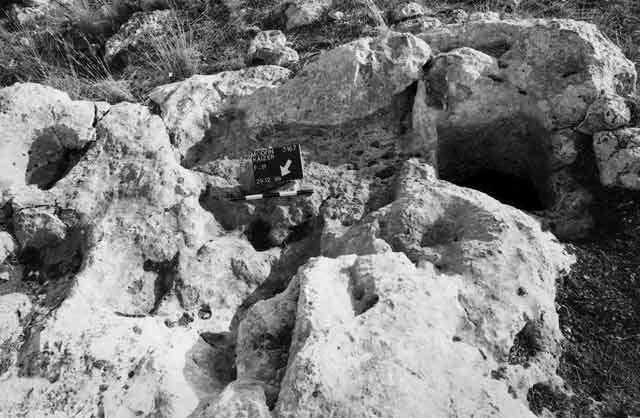 The rock-cut installations included two winepresses (Sites 11A, Fig. 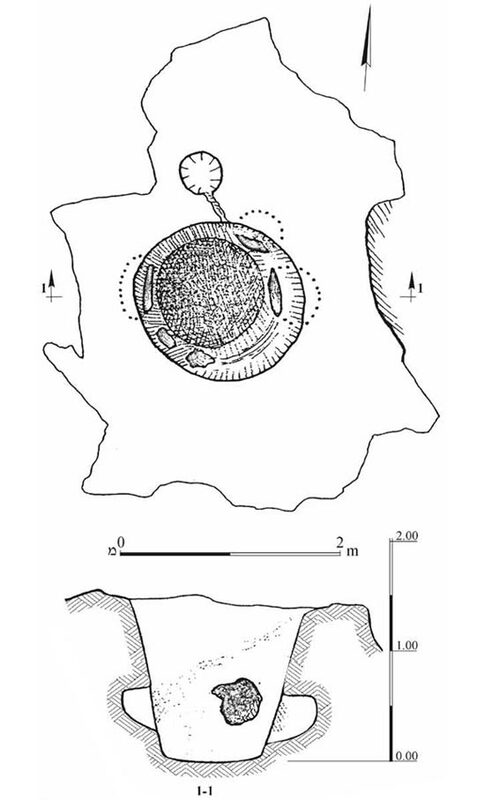 4; 165), two vats (Sites 11B, 41) and an installation (Site 678) hewn in leveled bedrock, which consisted of an oval pit (0.7 × 1.0 m, depth 0.55 m) and a vat (c. 0.6 m long, 0.35 m deep). A limekiln (Site 1032; diam. 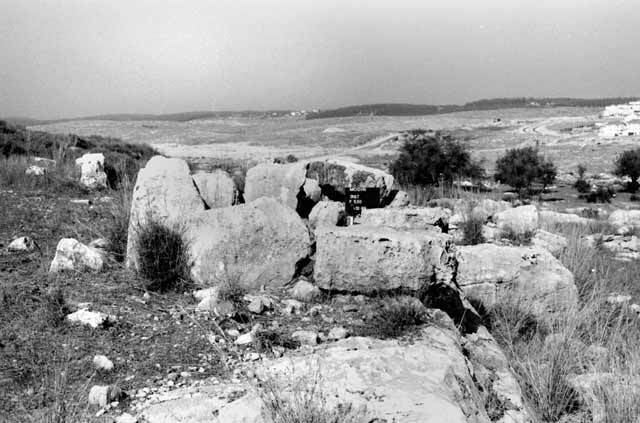 3.3 m), topped by a terrace and remains of a watchman’s booth (Site 424; 4.0 × 4.5 m) that was probably turned into a stone clearance heap at a later stage, were excavated. Toward the bottom of the hill’s western slope was a built room (Site 1000; Fig. 5; 3.85 × 5.10 m) preserved a single course high. The structure was erected directly on leveled bedrock and a hewn channel (length 0.75 m, width 0.2 m) was located at its western end. Several pottery fragments from the Byzantine period were found on the room’s floor. Three winepresses (Sites 168, 172, 581) were excavated. Winepress 581 consisted of a treading surface with two conduits leading to two collecting vats, to the north (Fig. 6). In a later phase, when the winepress was no longer used, a courtyard with two openings that led to burial caves was hewn in the place of the treading surface. One opening (0.50 × 0.74 m) was hewn in the eastern wall of the courtyard and the second (0.5 × 0.7 m)––in its northern wall. The cave in the eastern wall was destroyed and the other cave was not excavated. The meager finds included a few fragments of pottery vessels from the Early Roman period. To the west of Winepress 168 was a small quarry (Site 168B; 3.8 × 8.0 m), as well as a hewn shaft (Site 168A, depth 2 m) with an oval opening (diam. c. 1 m), which was probably intended to be a water cistern but was never completed. An irregular-shaped hollow that was used as a trough was hewn east of the shaft. North of the shaft was a hewn pressing installation that included a square treading surface (0.4 × 0.4 m) alongside two circular vats (diam. 0.35 and 0.40 m, depth 0.3 m). 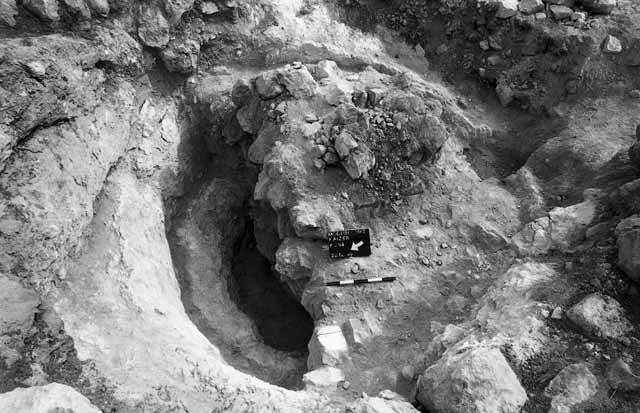 A conical pit (Site 173; diam. of opening 1.5 m, depth 1.5 m; Fig. 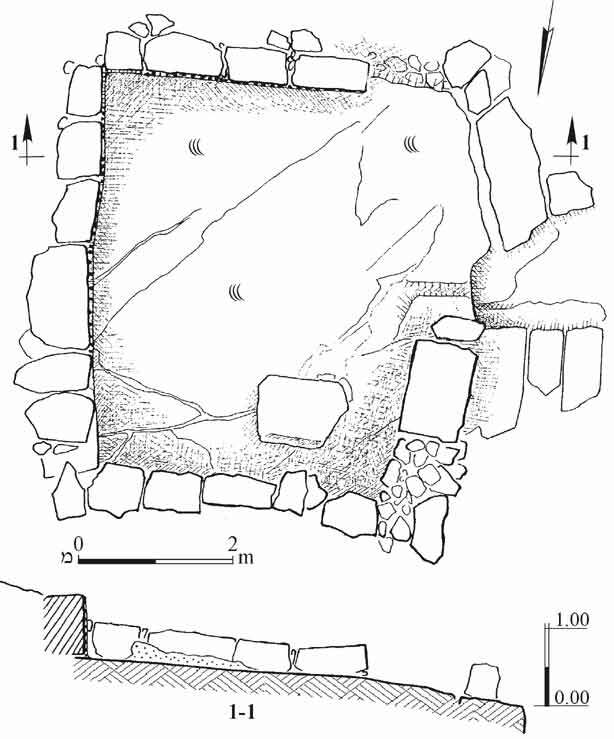 7) with a flat bottom and five hewn niches at the base of its wall was excavated. Terraces and stone clearance heaps (Site 24) were investigated and a prehistoric excavation was conducted after the discovery of flint implements from the Pre-pottery Neolithic A period. Three hewn vats were discerned on a sloping bedrock surface (Site 801). A limekiln (Site 95), a watchman’s booth built over it in a later phase and a stone clearance heap that was piled up on the site in the last phase (Fig. 8), were exposed. The finds included a few pottery fragments from the Hellenistic, Byzantine and Ottoman periods. A small rock-cut winepress (Site 95A) was to the west of Site 95. 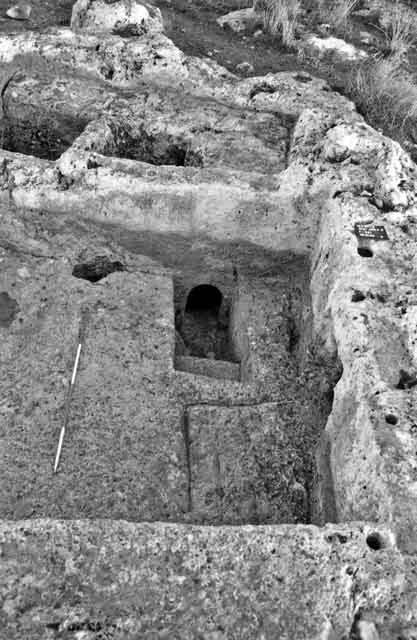 It had an irregular treading surface (0.75 × 0.90 m) that drained into a rectangular collecting vat (0.55 × 0.65 m). A hewn vat (Site 93A; diam. 0.45 m, depth 0.25 m) was discerned on surface to the south. 1. Map of the excavation areas and sites. 2. Area B, Site 700, looking west. 3. Area B, Site 84, looking east. 4. Area C, Site 11, looking southeast. 5. Area C, Site 1000, plan and section. 6. Area D, Site 581, looking north. 7. Area D, Site 173, plan and section. 8. Area G, Site 95, looking north.